The Hotel is closed from 21.12.2008 to 27.12.2008. Children until 6 years - free. 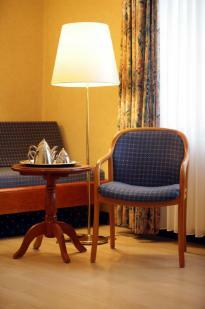 Later cancellations or no-show will require charging for 80% of the room rate for every reserved night. 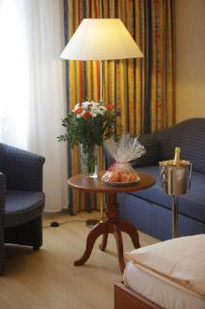 In case of a cancellation when it is not free of charge anymore, please contact the hotel to discuss the cancellation fee! It depends on each case! 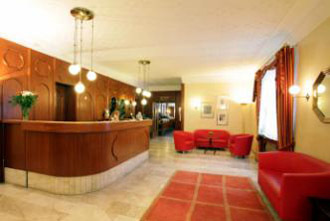 The hotel is situated in the centre of Munich. 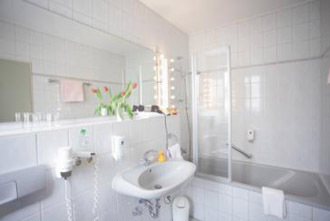 Next to the hotel you can find all public transportation facilities with direct links to Munichâ€™s famous attractions. Oktoberfest area is 1,6 km away. Mittlerer Ring - fast ring road is 500 meters away - and provides the best connections to all motorways. 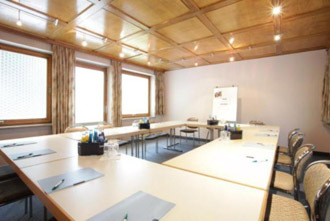 The congress centre ICM, trade fairgrounds and Allianz Arena are 20 minutes from the hotel by car or underground. 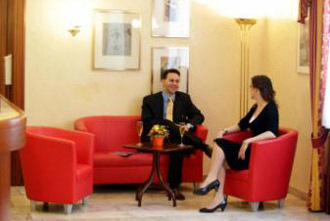 Excellent location for tourists as well as businesspeople. Drive to the end of the motorway - Direction Garmisch A 95 (at the round about turn right at traffic light! )- straight on - at the end of the street turn left into "Landsbergerstr" - keep on driving straight on a couple of km. -Turn right into "FĂĽrstenriederstr" (FORD car-dealer on the right side)- Direction Garmisch A95- straight on -at the "Burger King" turn left into "Waldfriedhofstr" - keep on driving always straight on -after "IWIS Ketten" (a yellow building on the right) turn left into "HansastraĂźe" - Hotel Carmen on your left side. Autobahnkreuz MĂĽnchen SĂĽd/Brunnthal- Direction Lindau/Garmisch/ M.-Giesing on the A95 -at the end of the motorway (Autobahn) keep on driving straight on at the Mittlerer Ring Direction Lindau/Garmisch- after "BrudermĂĽhltunnel" take the exit "Sendling"- turn right into "Passauerstr" -keep on driving straight on - Passauerstr. continous into the Hansastr.after aprox. 600 meters- Hotel Carmen on your left side. Exit MĂĽnchen-Schwabing - Mittlerer Ring West direction Garmisch A95- pass by the Olympiazentrum direction Garmisch A95 - pass by exit A96 Lindau - aprox. 1 km after the exit A96 (TOTAL gas-station on your right side) place you on the left side and at the next cross-roads ("Luise Kieselbach Platz ") turn left into "Albert-RoĂźhaupter Str. 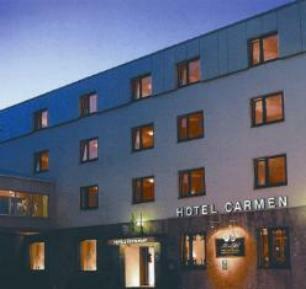 "- drive straight on - After "IWIS Ketten" (yellow building on the right) turn left into "Hansastr" - Hotel Carmen on your left side. Drive to the end of the motorway -Exit "Sendling" -Direction Autobahn Garmisch A95 - after aprox. 1 km (TOTAL petrol station on your left side ) place you on the left side and turn to the left into "Albert-RoĂźhaupter Str." on the next cross road ("Luise Kieselbach Platz") - drive straight on - after "IWIS Ketten" ( yellow building) turn left into "HansastraĂźe" - Hotel Carmen on your left side. Drive to the end of the motorway - traffic lights left - turn right into "Albert-RoĂźhaupter Str." on the next traffic light - drive straight on - after "IWIS Ketten" (yellow building) turn left into "HansastraĂźe" - Hotel Carmen on your left side. Direction Munich - follow Mittlerer Ring direction Lindau/Garmisch - after "BrudermĂĽhltunnel" take the exit "Sendling"- turn right into "Passauerstr" -keep on driving straight on - Passauerstr. continous into the Hansastr. after aprox. 600 meters- Hotel Carmen on your left side. take S7 (dir. "Wolfratshausen") or S27 (dir. 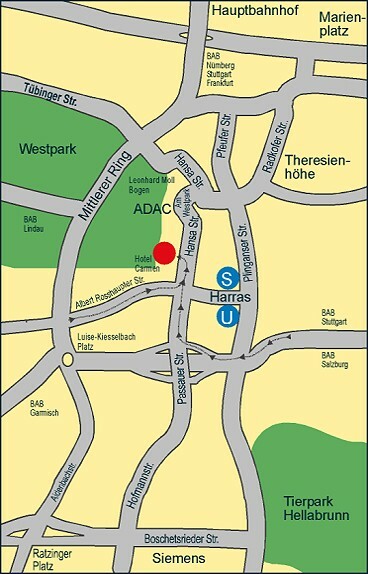 "Deisenhofen") and get off at station "Harras". Please, get off and go in the same trainÂ´s direction. Go down stairs and then right. From the bus stop follow the sign "FundbĂĽro". take S8, change at "Marienplatz" and take U6 (dir. "Klinikum GroĂźhadern") and get off at station "Harras". Follow signs "FundbĂĽro". take U2 till "Marienplatz" change into U 6 dir. "Klinikum GroĂźhadern" and get off at station "Harras". Follow signs "FundbĂĽro".